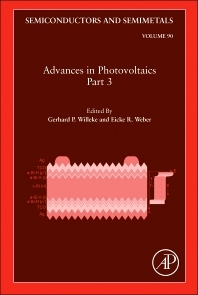 This volume is the third of a set of seven on the topic of photovoltaics. Solar cell-related technologies covered here include: ribbon silicon; heterojunction crystalline silicon; wafer equivalent crystalline silicon; and other advanced silicon solar cell structures and processes. Semiconductors and Semimetals has distinguished itself through the careful selection of well-known authors, editors, and contributors. Originally widely known as the "Willardson and Beer" Series, it has succeeded in publishing numerous landmark volumes and chapters. The series publishes timely, highly relevant volumes intended for long-term impact and reflecting the truly interdisciplinary nature of the field. The volumes in Semiconductors and Semimetals have been and will continue to be of great interest to physicists, chemists, materials scientists, and device engineers in academia, scientific laboratories and modern industry. Physicists, solid state scientists, device engineers, semiconductor researchers, materials scientists and industrial practitioners. Gerhard Philipp Willeke was born in Dortmund, Germany, in 1954 as a German National. He received a Dipl.-Ing. degree in electrical engineering from the University of Dortmund, Germany, in 1979, and the Ph.D. degree in physics from the University of Dundee, Scotland in 1983. From 1984 to 1989 he was with the Interuniversity Microelectronics Center, IMEC, Leuven, Belgium, where he worked on amorphous and crystalline silicon solar cell technologies as a Project Leader. From 1989 to 1999 he was a Research Assistant and Group Leader in the faculty of physics of the University of Konstanz, Germany, where he currently is a part-time Professor in experimental physics. Since 1999 he is with the Fraunhofer Institute for Solar Energy Systems ISE in Freiburg, Ger-ma¬ny, where he was head of the solar cell department between 2000 and 2006. Between 2007 and 2010 he was heading the newly founded Fraunhofer Center for Silicon Photovoltaics in Halle (Saale), a joint activity between the Fraunhofer Institutes for Solar Energy Systems ISE and Mechanics of Materials IWM. Since 2010 he is Manager Photovoltaics in the board of directors of Fraunhofer ISE in Freiburg. Gerhard Willeke has authored/co-authored 240 scientific/technical publications. He is member of the editorial board of the international journal ‚Progress in Photovoltaics‘. He served for many years as a member of the scientific/executive committee of the European Photovoltaic Solar Energy Conference and Exhibition where he became conference general chairman of the 22nd EUPVSEC in Milano, Italy in 2007. Since 2010 Gerhard is ‘Institution Board Director’ of the International Solar Energy Society ISES and Chairman Photovoltaics of the Intersolar Europe Conference in Munich, Germany. Gerhard Willeke is married since 1982 and has one son (born in 1983 in Dundee, Scotland) and two daughters (born in 1985 in Leuven, Belgium).